Tsunami and Preparedness/Survival Go to the Home Page. 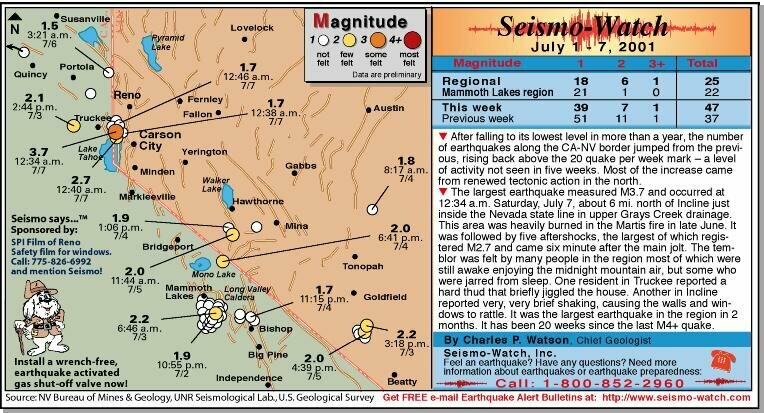 Doug Coop's "Survival in Earthquake Collapse" - "The Triangle of Life"
USGS : Recent Southern California & Nevada Earthquakes with fault lines shown & List & Alphabetical Fault List & Fault Movement & Fast Map & Shake Map; So. Cal. & No. Cal. Ca. 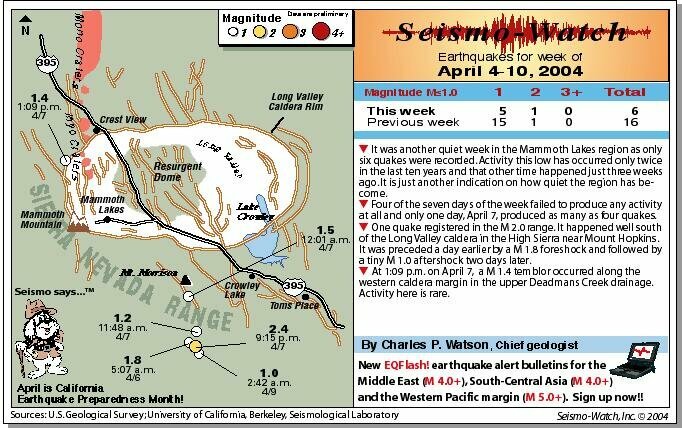 Index Map - S. Cal (Cal. Tech. )- N. Cal. (Menlo Park) - CA-NV - N. Cal. - S. Cal. - Pacific N.W. Mammoth Lake - Long Valley Caldera - Hot Creek Gorge - Thermal Springs - Mono Lake, Ca. 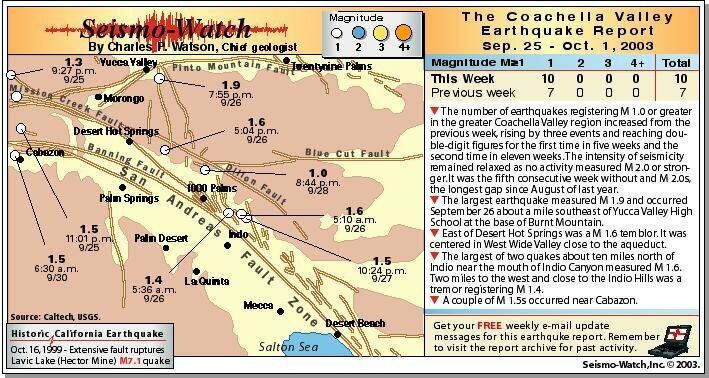 To report a felt earthquake, select your region from the map or the list below the map. Alaska - Hawaii - Western U.S./Mountains - Pacific N.W. - N.E. U.S - Central U.S.
P.R. & Territories - Outside, Non-U.S. - Unlisted/Unknown - Shake Maps, What Are They? 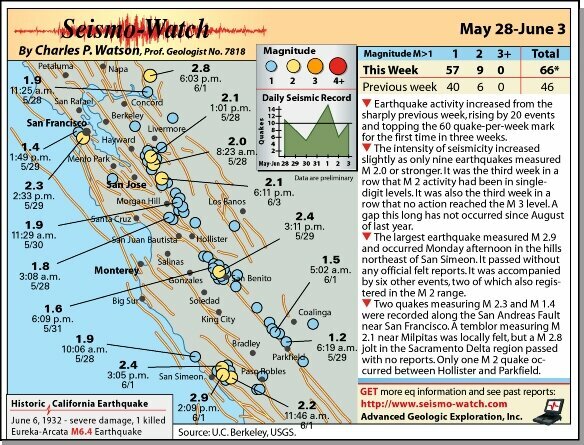 Current California Seismicity, the U.S., and the World (click maps, links, USGS) - Largest Earthquakes in the U.S.A.
For Kids: Earthquakes (USGS) For Teachers: by Topic or Grade Level + Complete Index by: K-4, 5-6, 7-9, 10-12, undergrad, grad, all or general audience. ..	Get a Kit, then .. Make a Plan and .. Be Informed. " (src: (ECTV) also in Cambodian - Chinese - Korean - Spanish - Tagalog - Vietnamese [.pdf])  Poison Control Center: If you have a poisoning emergency, call 1-800-222-1222. If the victim has collapsed or is not breathing, call 911. Find your poison control center. ASPC Poison Control Center (PCC) ASPC PCC: 1- (888)426-4435.